Iveco Brand President Pierre Lahutte (left) with International Truck of the Year Chairman Gianenrico Griffini. The new Iveco Eurocargo has been awarded the ‘International Truck of the Year 2016’, making the medium-duty truck the fourth Iveco vehicle to claim an award in as many years. The decision by a panel of 25 commercial vehicle journalists means the Eurocargo follows in the shoes of the Stralis in 2013, and adds to the ‘International Van of the Year 2015’won by the Daily and the ‘International Coach of the Year 2016’ award won by the Magelys. "Iveco has delivered a new medium duty truck that, once again, raises the bar in a highly-competitive segment in which Eurocargo has set the market benchmark in the last 25 years," International Truck of the Year Chairman Gianenrico Griffini says. 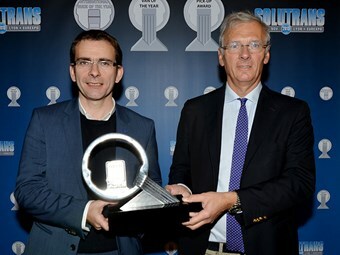 Receiving the award at the Solutrans, the French biennial trade fair for haulage and urban transport professionals, Iveco brand president Pierre Lahutte says the focus has been on sustainability. "We are very proud of this recognition for our New Eurocargo, the truck that the city likes because it is respectful of people and the environment," Lahutte says. "It is the latest generation of a vehicle that, with half a million sales worldwide, has been holding the leadership in the European medium segment for years. "In the last four years we have won this award in all categories: this is an absolute record. "We are the only truck and bus manufacturer that has in production four ‘vehicles of the year’, a strong recognition of the investment the group has made in our product range renewal as well as the leadership of our technology such as our Euro VI HI-SCR." 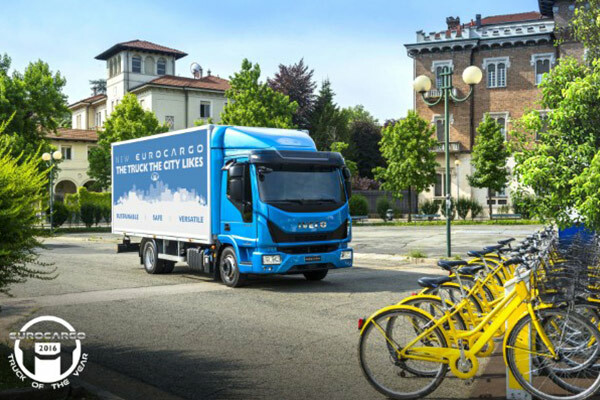 Iveco says the Hi-SCR system with passive diesel particulate filter makes the Eurocargo the only vehicle in the Euro 5 medium-duty class to use a single anti-emission system. To be eligible for the award a truck must have been launched within the last 12 months. It is then judged upon technical innovation, comfort, safety, driveability, fuel economy, environmental footprint and total cost of ownership. As part of their decision, the IToY journalists noted the truck’s driveline, available in 4- or 6-cylinder engine options; its compressed natural gas (CNG) options; and its new cab, which substantially reduces noise on motorways. "Iveco’s new medium duty truck cab interior is a multi-functional ‘office on-the-move’ with its central console pre-configured to integrate with smartphones, tablets and GPS-based navigation systems, as well as advanced telematics solutions," the body says. "The latter are managed by the Drivelinc central touchscreen display that offers a user-friendly interface for messaging, fleet management and driving-style support measures." Also of note was the availability of a ‘super-eco’ variant which runs on CNG and a two-pedal Astronic automated box.